I remember in July of 2005 when I summoned up enough courage to jump out of the corporate America’s rat race and jump into being a full time business woman. I started off as an independent contractor with a direct sales company and have since been able to launch two other thriving businesses. It sure was not an easy decision to make, but I remember when I got home and knelt down to pray, I said, “God, I don’t know what I have done, but I think I heard you right when you said ‘jump. '” And immediately and very distinctively, I heard the voice of God in my spirit say, “Nina, if you’re going to trust me, then trust me. All I need you to do is give it your all, give me something to bless, Nina!” It was such a serene and profound moment of my life and it’s amazing how that gave me so much re-assurance, it tended to alleviate the fear that had somewhat built up in me. I decided to give my business my all and it worked! The rest is so history now. Not only was I able to replace and exceed my job income the first year, the second year, I doubled my income and by the third year, I was in the six figure income bracket and in my mid twenties. With that said, allow me to encourage you to take mighty risks this new year and in taking such risk, you must commit to doing the work it takes to see progressive success. Successful people are not lazy. 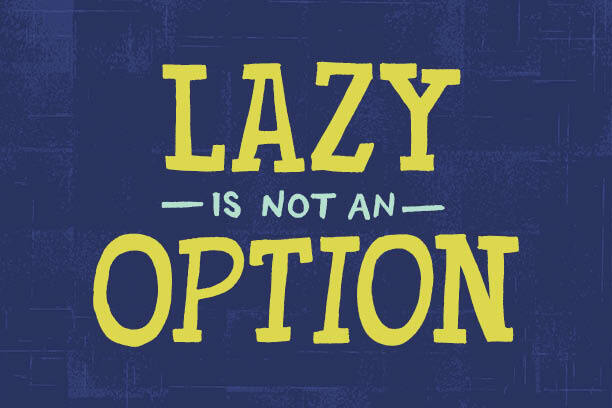 I dare to emphatically say that if you must change your story in 2014 then lazy is so not an option! Decide to do something DAILY towards your goal and success is inevitable! Didn’t the Bible say that the steps of the righteous are ordered by God? And that God will bless and prosper the works of our hand. Lazy people don’t step and they don’t work, so there’s nothing for God to bless. You leave him with no option but to wait for you to ACT! Dare to ACT! You will make mistakes, but don’t let those stop you. Learn the lessons in your mistakes and keep it moving. For me, it’s been 9 years of entrepreneurial success with highs and some lows but I would not trade any of my business and life experiences for the world. I had made some mistakes and each time, though painful, owned my mistakes and each one of them have contributed to who I have become today. They were part of my defining moments, in addition, every lesson learned has prepared me for right NOW! I am so ready – much better ready – to take on 2014 and beyond. I hope that you will find the inner courage to work hard towards achieving your dream and become all that you were destined to be, who’s with me? I’ll love to read your comments below. Hi Nina, i totally agree with you and i love your blogs, they are so inspiring.